The Preferences > Interface sub-palette controls how the user interface looks and reacts. 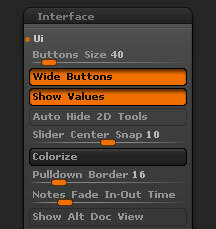 The Button Size slider affects the size of interface items. Setting the slider to a higher value will increase the size of buttons, switches and so on. However, note that the text on the buttons does not increase in size. 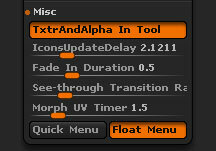 After setting the slider it is necessary to restart ZBrush before the change will take effect. The default setting for this slider is 40. The Wide Buttons switch affects the size of the small icons that appear in some palettes such as the Brush or Tool palettes. When Wide Buttons is turned on these icons will be twice as wide as they are high. With the switch turned off, the icons will be square. If the Auto Collapse switch is turned on, ZBrush attempts to keep all palettes visible in the Left and Right Trays. If space is needed to accommodate a newly-expanded palette then other palettes will be automatically collapsed. With the switch turned off, all palettes will remain expanded unless you close thm by clicking on their title bars. You can access the palettes by sliding the tray panels up or down – the cursor will changed to a double-arrow. With the One Open Subpalette switch turned on, any open sub-palette will be closed whenever a new one is opened. This can help with navigating the palette by reducing up and down scrolling. However, holding Shift when clicking a sub-palette name will mean that other sub-palettes remain open. Turn this option off to have sub-palettes remain open until you click them closed. If the Left Tray Auto Collapse button is pressed, only one palette can be expanded at a time in the Left Tray. When another palette is expanded, other open palettes automatically collapse. If the Right Tray Auto Collapse button is pressed, only one palette can be expanded at a time in the Right Tray. When another palette is expanded, other open palettes automatically collapse. The Accelerated Scroll switch affects the speed of scrolling the Left and Right Trays up and down. When the switch is on, the scrolling will increase in speed as the distance increases. The OpenClose Duration slider sets the speed at which the palettes and sub-palettes open and close. Some sub-palettes, such as this Preferences>Interface sub-palette, have been divided into further sections or UI Groups. These sections operate in much the same way as the sub-palettes. Turning off the Use UI Groups switch will remove the sections. With the AutoClose UI Groups switch turned on, any open section will be closed whenever a new one is opened. This can help with navigating the sub-palette by reducing up and down scrolling. However, holding Shift when clicking a section name will mean that other sub-palettes remain open. Turn this option off to have sections remain open until you click them closed. A similar option is available for palettes when they are docked in the left or right trays. With the Palette Popup option turned on, only one palette will show in a tray. Clicking the palette name will show a list of palettes in alphabetical order, so that another palette can be chosen. Note: only those palettes that have be dragged to the tray will show. Enable the Right-click popup menu.